The course is complemented by carefully contoured fairways, beautiful water cascades, lakes and strategically placed bunkers as well as undulating greens, protected and maintained in perfect condition. 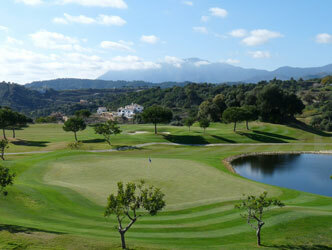 Marbella Club Resort is a private course, thus only allow limited greenfee players, great course to play during high season. Erbjudande 8x7-1 spelare gratis, golf bil ingår inte, tom 31.12.14. Hotel i närheten: Puente Romano Club Hotel, en av de bästa hotellen på kusten. Green fee ingår i rum pris och transfers till och från golfklubb. Kanon läge, ligger på stranden mellan Marbella och Puerto Banus.